Packets Never Lie: Static NAT - Does the order of commands matter? I've implemented the following scenario to demonstrate the behavior of the ASA/PIX that we could see after to change the order of the Static NAT rules. The web server is located at dmz network and is published to the Internet using a Static NAT. The hosts located at inside network have access to the Internet and the dmz using a PAT overload over the IP addresses assigned to the firewall interfaces. The relevant settings to this article are presented below. 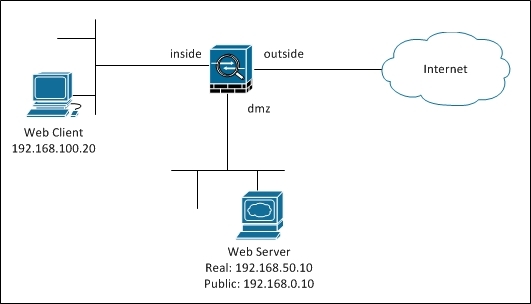 Although the result is indicating that the traffic would be allowed and forwarded properly, the phase 7 indicates that the static between dmz and outside would be applied to the replies from the server to the host. Trying to fix this issue, I implemented an Outside Static Identity NAT to match the traffic between inside and dmz, resulting in the rules below. Now we can not see a match to the static between dmz and outside anymore. Thus, the conflict was fixed and the traffic would be allowed and forwarded properly.